Touching tomb inscriptions from the ancients, in Greek and Latin, with English tranlsations. The universal sentiments expressed in this anthology of inscriptions and epitaphs portray a poignant slice of ancient lives: their joy in the temporal life, their grief at its passing, and their faith in an eternal life of bliss. 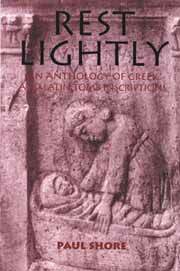 Rest Lightly includes 29 tomb inscriptions and an additional 13 plates/illustrations from the 1st through the 7th centuries with transcriptions, annotations and verse translations into English. Join hearts with our ancient family as they celebrate the lives and mourn the deaths of their beloved children and friends, sisters and brothers, wives and lovers.